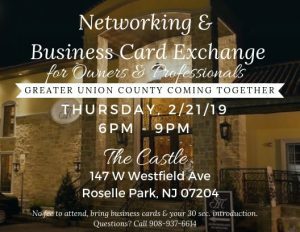 My invitation is for you to join us for our 2nd networking & business card exchange on Thursday, February 21st. There is no fee for you to attend and we ask that you bring business cards and some brochures that you would like to share. Please reply here, call or text me at 908-937-6614 if you are interested. ▪ if you are new to networking altogether and have some great things about your business or how you can help others and want to get the word out. You do not have to live or work in Union County, NJ to be part of this event, it is open to professionals within and the surrounding area. As long as you bring a smile and value, we welcome you! 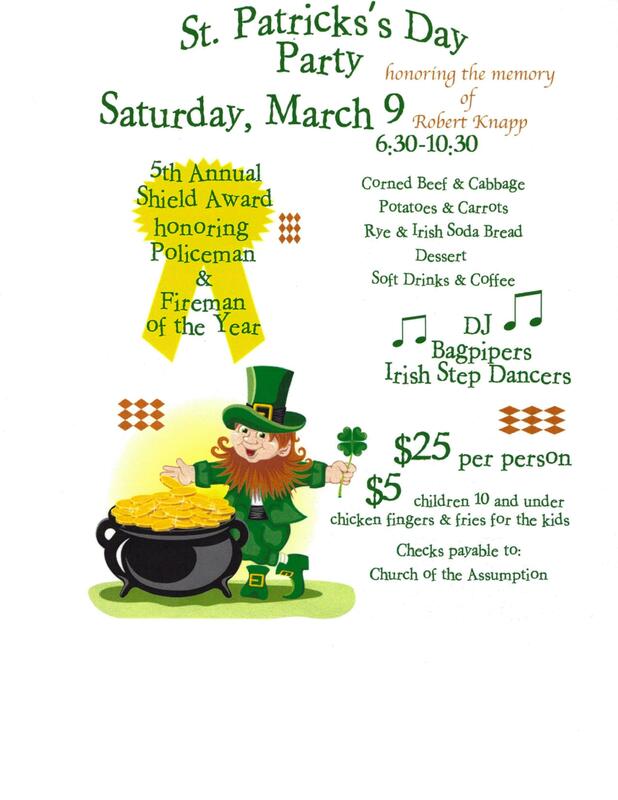 St. Patrick’s Annual Dinner Party to honor Roselle Park’s Policeman & Fireman of the Year. 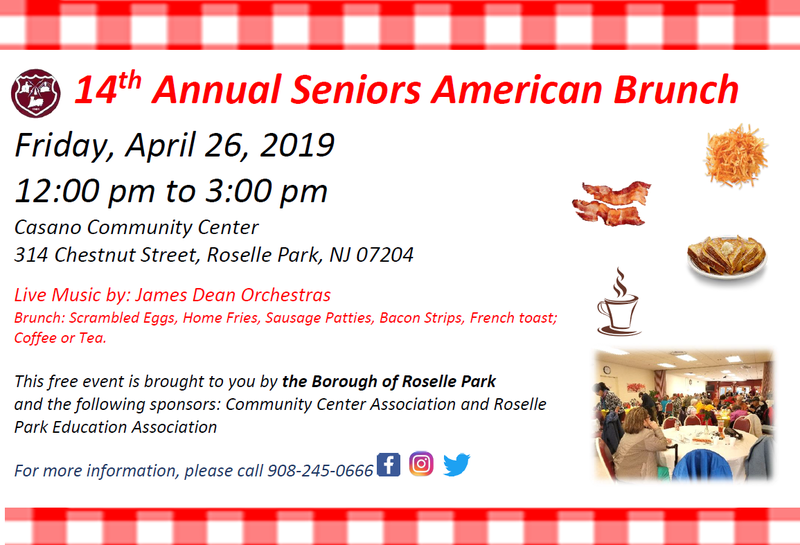 Saturday, March 9th, 6:30-10:30, at Church of the Assumption, 113 Chiego Pl., Roselle Park….. Corned Beef & Cabbage dinner. Potatoes, carrots, rye, and Irish soda bread. Desserts, Soft Drinks, and Coffee. DJ, Bagpipers and Irish Step Dancers. Adults $25, Children under 10 $5 (chicken fingers and fries)… Make checks payable to Church of the Assumption. Tickets can be purchased after every mass from 2/17 – 3/3. 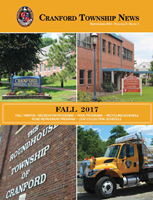 Or call the Parish Office at 908-245-1107 or John Kennedy at 908-245-0440. 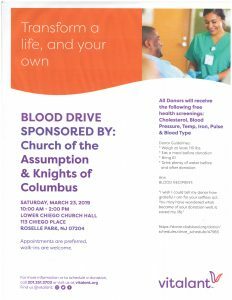 BLOOD DRIVE SPONSORED BY: Church of the Assumption & Knights of Columbus SATURDAY, MARCH 23, 2019 10:00 AM – 2:00 PM. LOWER CHIEGO CHURCH HALL 113 CHIEGO PLACE ROSELLE PARK, NJ 07204 Appointments are preferred, walk-ins are welcome. All Donors will receive the following free health screenings: Cholesterol, Blood Pressure, Temp, Iron, Pulse & Blood Type Donor Guidelines: * Weigh at least 110 lbs. 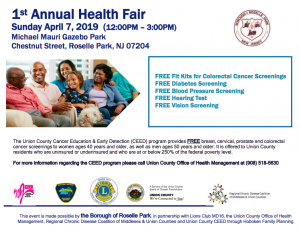 The Borough of Roselle Park in partnership with Lions Club MD16, the Union County Office of Health Management, Regional Chronic Disease Coalition of Middlesex & Union Counties and Union County CEED through Hoboken Family Planning presents the First Annual Community Health Fair. The health fair will be held from 12 p.m. to 3 p.m. Sunday, April 7, at the Michael Mauri Gazebo Park. 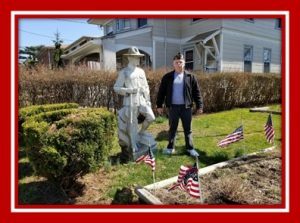 Chestnut Street, Roselle Park, NJ 07204. It will include health screenings, giveaways, door prizes, and children’s activities. 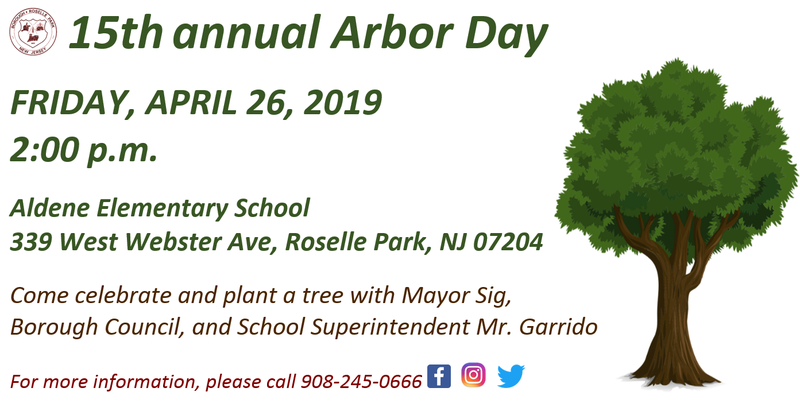 For more information, or to participate please contact Rupen Shah at 908-245-0666 or email [email protected].